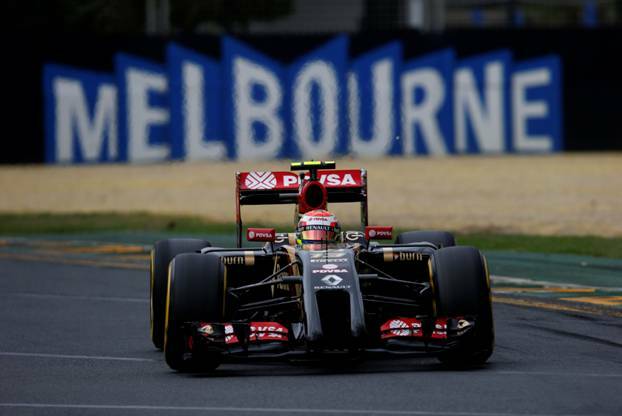 A tough season opener and a difficult start to the 2014 F1® season for The Lotus F1® Team down-under. They always said it was going to be a dramatic first race in this new era of F1® and dramatic it was. Melbourne’s Albert Park 3.3 mile circuit provided the stage for top-flight motorsport entertainment that saw Lotus put up a positive assault in what was always going to be a tough race for the black and gold team. Disappointing qualifying for both drivers meant whilst Pastor Maldonado began at the very back of the grid, Romain Grosjean began from the pit-lane and was then further slapped with a drive-through penalty for leaving the pit garage early. Never-the-less, after lights out Maldonado was soon on the march and ascended to P11 before problems with the Motor Generator Unit – Kinetic (MGU-K) hampered his fight resulting in his retirement in lap 29. Grosjean faired marginally better in spite of the odds. A consistent battle from lights-out saw him needle through the back of the field ascending to P12. However, with just 12 laps to go MGU-K problems for Romain Grosjean determined his retirement also. The next round of the competition see’s the team head to Malaysia and to the Sepang circuit in Kuala Lumpur on the 30th March. This entry was posted in Lotus F1 Team and tagged 2014, Australia, Australian GP, F1, Lotus F1 Team, Pastor Maldonado, Romain Grosjean. Bookmark the permalink.